Following a Heisman-winning season as a junior, Sanders chose to forego his last year of eligibility and turn pro. Taken by the Lions in the first round of the 1989 NFL draft (third overall), he had an immediate impact, rushing for 1470 yards and 14 touchdowns. He was not just Rookie of the Year but went to the Pro Bowl and was a consensus first team All-Pro. Sanders made up for lack of size with outstanding elusiveness and running instincts. He followed up with a league-leading 1304 yards in 1990 and 17 touchdowns, to go along with 1548 rushing yards in ‘91, and was a first-team All-Pro and Pro Bowl selection after each. Sanders continued to be chosen to the Pro Bowl in 1992 and ’93, although he missed the last five games in 1993 due to a sprained knee ligament. Still, he rushed for 1115 yards while averaging 101.4 yards per game. Lions went 9-7 to finish third in the NFC Central while qualifying for a Wild Card playoff berth and leading the NFC in rushing yards (2080). Lost NFC Wild Card playoff to Green Bay Packers (16-12). Sanders rushed for 1500 yards in 1995 and maintained his excellence over a career of ten years before abruptly retiring after the 1998 season. He led the league in ground-gaining four times, including a 2053-yard total in ’97, and never failed to gain a thousand yards – his lowest total was the 1115 in 1993, when he suffered his only extended loss of playing time. 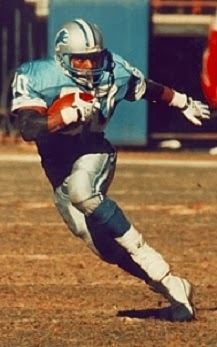 Sanders was selected for the Pro Bowl following all ten seasons, was a consensus first-team All-Pro six times, and with his exciting, often-improvisational running style was a highlight film regular. He retired with 15,269 rushing yards and scored a total of 109 touchdowns. Sanders was inducted into the Pro Football Hall of Fame, Class of 2004.